Storey Publishing, LLC, 9781612129945, 208pp. From the Vending Machine Feeder to the Refilling Rainwaterer, Hyman’s innovative building projects are designed to save time and money while keeping chickens safe, healthy, clean, and well fed. Featuring easy-to-follow instructions and colorful photos, the 21 projects for the chicken yard range from creative doorways, nest boxes, fencing, and roosts to a predator-proof pen, a “Chunnel” chicken run, and a sturdy but inexpensive coop made from wooden pallets. With a lively, humorous voice, Hyman generously shares his expert advice on all aspects of chicken-keeping. 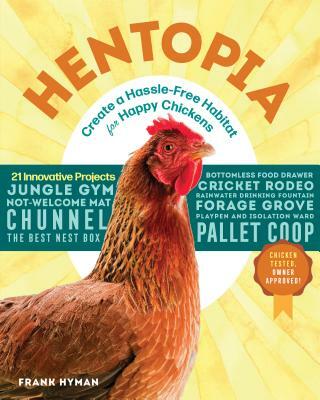 Requiring minimal previous carpentry experience and using many salvaged or found materials, Hentopia is within reach of every aspiring chicken-keeper.